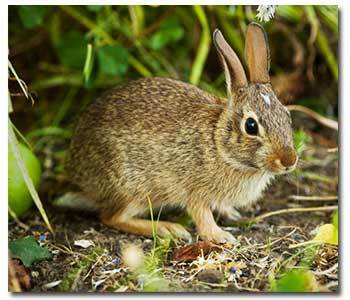 Are Rascally Rabbits Wreaking Havoc in Your Garden? What’s up is that you have a lush, perfect garden that’s become a salad bar for rabbits. Granted, the destruction these little varmints cause is nothing compared to what happens when Bambi strolls through. Yet, seeing your hard work munched by anyone but you is frustrating. Fortunately, we have ways to protect your peas and save your spinach! Rabbits are pretty simple in their motivations: eat and procreate. The latter may not seem relevant, but rabbits can produce up to 18 babies in one breeding season, thus increasing your problem! There’s not much we can do about that; but you can learn about their eating preferences, because unless they’re super hungry, rabbits are picky eaters. These little rascals would rather dine on tender, young plants since stems and leaves get tough after a couple months’ growth. They also LOVE clover and alfalfa. While those aren’t typically garden staples, they are valuable partners in solving your rabbit problem. In addition to being picky, rabbits are extremely shy, timid animals. You’ve probably noticed more signs of rabbits at the edges of your garden than in the middle. That’s because rabbits like to eat in areas where they can easily run and hide, if discovered. Get rid of their hiding places. They like tall grass, stone piles, and brush piles. No place to hide may discourage your hungry visitors. Plant a small rabbit buffet, if you can, full of sweet clover and yummy alfalfa. These are more appealing than your veggies. No matter what you do, do it early in the season when your plants are most tempting. Wrapping plants with garden fabric is a quick method of closing the salad bar. Make sure to anchor the fabric, so unwanted diners don’t pull it off. Chicken wire is an option as well, and you can make a tunnel for an entire row of plants. Spraying around your garden with a repellent, such as Liquid Fence® Deer and Rabbit Repellent, is a sure turn-off for hungry rabbits. If the rabbits can’t find other food sources, though, they may just hold their noses and dig in anyway. Even if you can break one feeding cycle, your plants may be able to grow tough enough to turn the rabbits off themselves. You should reapply repellents every few days and also after heavy rains. You can also fence in your garden. Visit your local Grangetto’s and get some wire mesh (3/4″ is best) and sturdy stakes. Since rabbits burrow, you need to extend your fence at least 6″ below ground for maximum protection. Bend the top 5″-6″ of the fence away from the garden to help prevent them from jumping the fence. Regular cottontails require a 2′ high fence; however, if they’re hyper hares or jackrabbits, make the fence taller, around 3′. Sometimes you just have to eliminate the problem. No, don’t kill da wabbit! Grangetto’s carries Havahart® Traps, which are live traps; you can capture your critters without hurting them. Be sure to relocate them far away or take them to a rabbit rescue. If you release them too close to home, they’ll just come back. Follow this advice and your rabbit raids should become a thing of the past. Like the pig said, Th-th-th-that’s all folks!